Although the Maverick Festival has been regularly attended over the years, it has to be confessed that a Police Dog Hogan set has not been witnessed despite this seven-piece UK band being frequent visitors since their inception in 2009. However this situation will definitely be rectified after taking time out to give their new release a worthy and rewarding lengthy listen. Obviously this is down to the band being invited back but there is so much synergy between their sound and the vibes of this festival, that surely a return visit is inevitable. 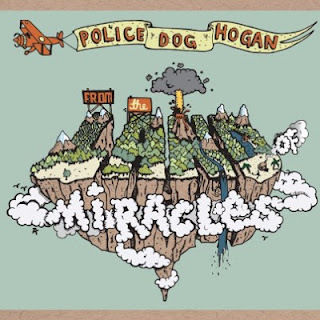 FROM THE LAND OF MIRACLES is the second full length album release from Police Dog Hogan who have a great knack of fusing a lot of Americana sounds without coming across as pseudo Americans. In fact they can join a growing batch of UK bands who are putting a very British stamp on the Americana genre, if that doesn’t sound too contradictory. Over the course of the eleven recorded tracks, they expertly manage to combine excellent musical arrangements with insightful lyrics as well as covering a diverse number of styles to unveil their versatility. Within a couple of bars of the opening track, the foot stomping ‘Better Go Now’, you can detect the influence of Americana legend Steve Earle and, low and behold, his name is mentioned a couple of songs later in ‘The More Things Change’. This song is probably the stand out track on the album and Earle is referred to along with his New Traditionalist compatriots Randy Travis and Dwight Yoakham. This pointed to a moment in country music history where change occurred without anything really changing. This track also contains a brief sampling Earle’s classic ‘Guitar Town’. Two other quality tracks on the record highlight the band’s diversity. ‘Fraserburgh Train’, selected as the album’s first single, is a wonderful account of a war participant’s mind wandering towards the journey home via the subject of the title. This has all the credentials of fine folk song, delivered in a waltz-like sea shanty style with a sing along chorus. By contrast ‘Devil Jim’ has an all together different sound with its rock n’ roll influences, while the harmonies of the band are best represented in the less frantic number ‘Matilda’. The album comes to a poignant ending with a split 4:37 segment commencing with a short a cappella piece called ‘The Banks’ before the bonus track, the delightful ’14 Roses’ slides effortlessly in to bring the record to a close. As you would expect from a band setting their stall out to give an interpretation of roots music, the sounds of mandolin, fiddle, banjo and dobra are interwoven with the usual guitar,and percussion input from drums and bass. The album has benefitted from the guidance of experienced producer Eliot James and the finished product is an accomplished record that the band can proudly take forward and promote around the country. Hopefully this will include a busy 2013 festival season and, perhaps, a return visit to Maverick where their set will be eagerly awaited this time.